I would like thank you for considering me for the [project manager] position at [ABC Corporation]. 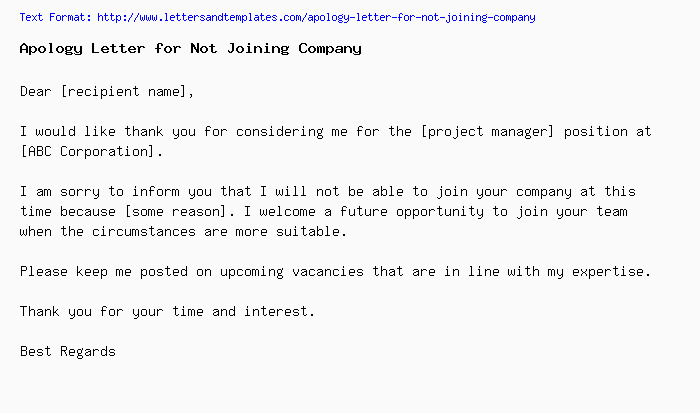 I am sorry to inform you that I will not be able to join your company at this time because [some reason]. I welcome a future opportunity to join your team when the circumstances are more suitable. Please keep me posted on upcoming vacancies that are in line with my expertise. Thank you very much for the job offer letter. I am glad and honored that you’ve accepted me for the [project manager] position. However, please accept my apology for not being able to join your company because [some reason]. I regret any inconvenience resulting from my decision. I hope to join your team sometime in the future should the opportunity arise. Please keep me updated on similar vacancies.